Albuquerque is at the crossroads of central New Mexico, where Interstate 40 intersects Interstate 25. The largest city in New Mexico, it lies on a plain along the banks of the Rio Grande River, at the base of the Sandia Mountains to the east. Albuquerque represents a synergy of Native American, Hispanic and Anglo cultures where traditional and modern cultures coexist. 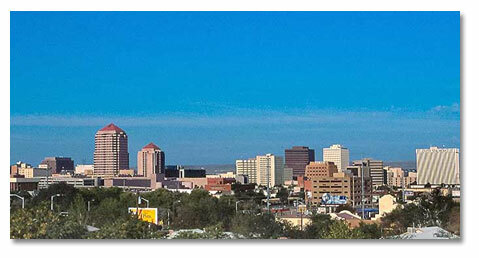 The University of New Mexico is centered in Albuquerque, and Sandia National Laboratory brings science and technology to this city of the city of the Old West. A number of Indian Reservations and Pueblos exist in and near the city. Albuquerque is renowned for its year-round, pleasant climate. 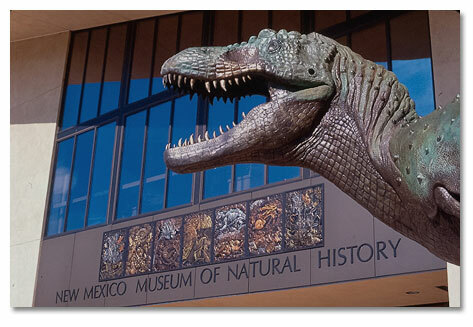 Low humidity and warm temperatures combine to make Albuquerque an enjoyable destination during any season. Southwestern informality prevails. Business occasions and theatrical events offer opportunities to dress more formally. During Albuquerque's warmer season, sweaters or jackets are advisable in higher-altitude areas. Evidence of habitation near Albuquerque dates back 12,000 years. The Anasazi Indians settled in the area and lived here for 2 centuries, from 1100 to 1300, establishing several communities throughout northwestern New Mexico connected by sophisticated transportation and communication networks. In 1540, explorer-conquistador Francisco Vasquez de Coronado came north from Mexico in search of the mythical Seven Cities of Cibola. He and his troops, cooks, priests, and beasts reportedly spent the winter of that year in an Indian pueblo on the west bank of the Rio Grande 20 miles north of Albuquerque. The site is now a state monument just northwest of the town of Bernalillo. Coronado left, and wealthy Spanish settlers began arriving in greater numbers, but the Pueblo Rebellion of 1680 discouraged further settlement until Spanish General Don Diego de Vargas arrived in 1692. By the 17th century it was sufficiently populated to have acquired a name: Bosque Grande de San Francisco Xavier. In 1706, the ambitious provisional governor of the territory, Don Francisco Cuervo y Valdez, petitioned the Spanish government for permission to establish the bosque as a formal villa and call it Alburquerque, after Viceroy Francisco Fernandez de la Cueva, the Duke of Alburquerque. "r" apparently fell out of use casually and over a long period. The US claimed the territory when General Stephen Kearny established an army post here in1846. Confederate troops occupied Albuquerque briefly in the Civil War and installed 8 defensive cannons (4 of them are still on display in Old Town). Once the war was over, Anglo settlers, mostly merchants, tradesmen, artisans, doctors, and lawyers, began arriving in force. The railroad arrived in 1880, affecting the development of specific sectors of the city and drastically altering its ethnic makeup. By 1885, Albuquerque had become predominantly Anglo in population. The consequent influx of residents from the East and the Midwest brought enormous changes to the prevailing architecture of the city, and to the region as a whole. In 1885, Albuquerque incorporated as a town, and 6 years later as a city. In 1889, Albuquerque won the rather heated battle for the right to locate the state university in the city. In 1912, New Mexico was admitted to the US, the 47th state in the Union (Arizona, the 48th, was admitted later that same year). Extending from Chicago to Los Angeles, the original U.S. Route 66, as it passed through New Mexico, was a circuitous (if all-encompassing) road running from Santa Rosa to Las Vegas to Santa Fe, down to Albuquerque, farther south to Los Lunas, and then back north and west along the railroad right-of-way. In 1937, Route 66 was straightened, running right along Albuquerque's Central Avenue. The Native American culture is probably the most deeply rooted of the many branches that make up the diverse ethnic and cultural environment of New Mexico. The Anasazi Indians were virtually the first identifiable inhabitants of the Southwest. They have bestowed a legacy of kivas, cliff dwellings and traditional arts and crafts. Ritual dancing, pow-wows, and feast days are a large part of Indian culture. Some of the dances are traditional, dating back to long before the arrival of Europeans in America; others reenact a variety of events that took place during the uneasy early stages of European-Native American relations. One excellent way to orient yourself before any visit to a pueblo is to tour the Indian Pueblo Cultural Center in northwest Albuquerque. Open seven days a week, the center offers a huge range of exhibits, performances, and information on Native American culture in general, and Pueblo Indians in particular. Of the center's many components (children's museum, gift shop, bookstore, restaurant), only the museum charges admission. Weekend performances of Native American dances, demonstrations of arts and crafts, and a variety of year-round special events are free to the public. The gift shop offers an array of fine pottery, paintings, sculpture, and weaving. Old Town near the center of the city is the site of the original settlement. The shops and galleries surrounding Old Town Plaza offer arts, crafts, gifts and wonderful food. Native American artisians vend their wares around the plaza where bargaining is in order. Santa Fe, New Mexico: 59 miles north. Socorro, New Mexico: 78 miles south. Truth or Consequences, New Mexico: 152 miles south. Petroglyph National Monument: Lies within the city. Coronado State Park: 20 miles north. Bandelier National Monument: 76 miles north. Salinas Pueblo Missions: 74 miles southeast. El Malpais National Monument: 92 miles west. El Morro National Monument: 122 miles west. White Sands National Monument: 215 miles southeast. Santa Fe National Forest: 50 miles north. Cibola National Forest: (13 separate parcels ) Adjoins the city. Sandia Crest: 16 miles east. Manzano Mountains: 25 miles southeast.